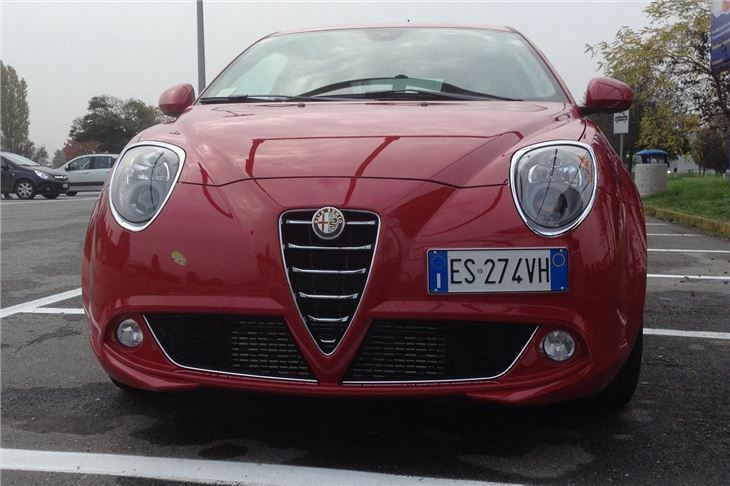 This is the fifth time we’ve covered the Alfa Romeo MiTo. 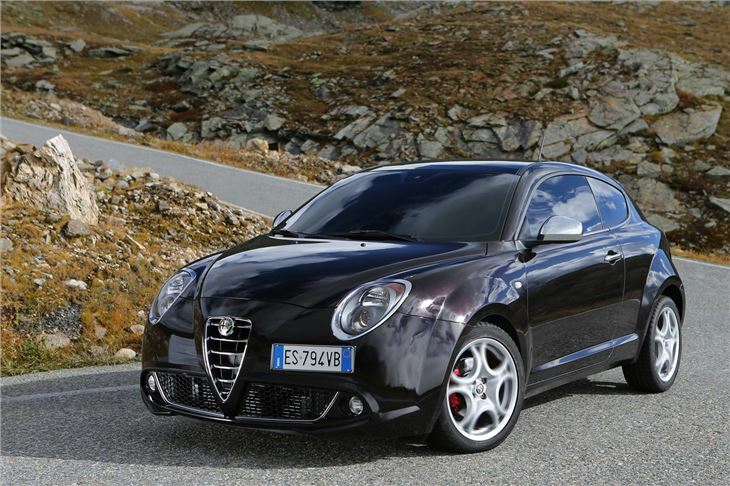 Which seems like a lot for a single niche hatchback/coupe, but they’ve refreshed it again for 2014. Power is up in the petrol engines and down slightly in the 1.3 MultiJet diesels, but developed at lower rpm, with maximum torque now from 1,500rpm instead of 2,000rpm. Performance is up from all petrol engines, but down very slightly from the 1.3 MultiJet and exactly the same from the 1.6 MultiJet. With switchable Start&Stop now on all, fuel economy is improved, with the 1.3 MultiJet now managing 80.7mpg in the EC tests. While CO2 is also down in all versions, with the TwinAir and the 1.3 MultiJet both under 100g/km, so free tax, and the petrol turbos now in Bands D and E.
sports rear bumper, as well as some new paint colours that now include a ‘Matte Magnesio Grey’. 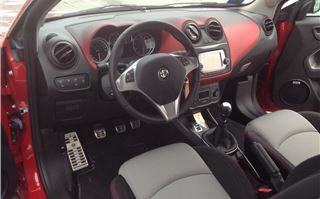 USB/Aux ports and optional satellite navigation. Prices kick off at £14,350. 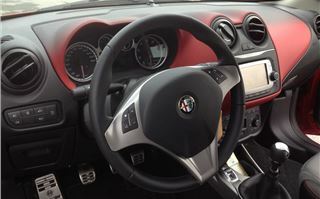 The Alfa DNA system remains standard allowing drivers to alter the character of the car to three settings: Dynamic, ‘Natural’ and ‘All Weather’. 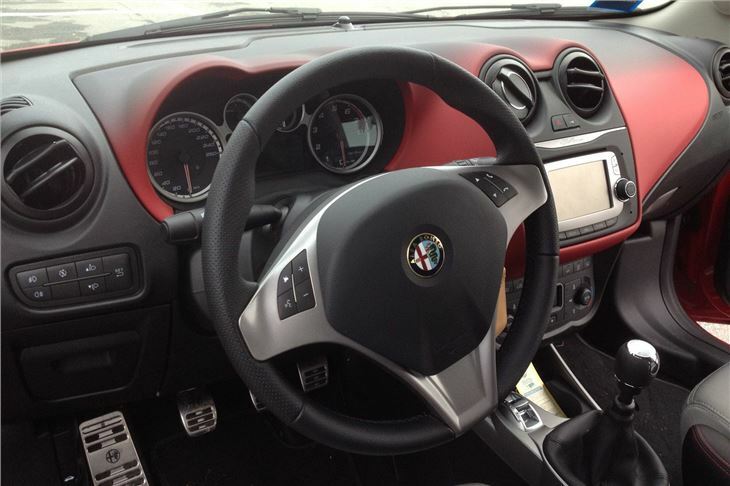 Where fitted the ALFA SDC adaptive suspension and ALFA TCT transmission settings are also adjustable via the ALFA DNA system. The four trim levels are now Sprint, Distinctive, Sportiva and Quadrifoglio Verde (QV). 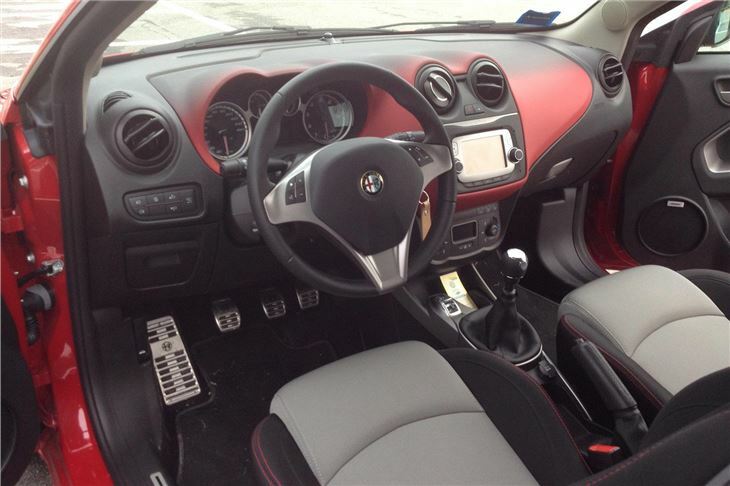 All have air conditioning; a leather-trimmed steering wheel and gear knob; electric windows and mirrors; seven airbags; front fog lamps, a rear spoiler and alloy wheels. Standard wheel and tyre size is 16” with 195/55 R16 tyres. ‘Distinctive’ spec comes with 17-inch alloy wheels and 205/45 R17 tyres; cruise control; rear parking sensors and a front centre arm rest. ‘Sportiva’ gets 18-inch QV sports alloy wheels; with 215/45 R18 tyres a QV steering wheel and hand-brake lever (trimmed in black leather with green stitching); satin-effect exterior highlights and special badges. And on top of that the high-performance QV adds red, four-piston Brembo brake callipers, SDC active suspension system, bespoke sports seats with uprated upholstery and special QV wing badges. It’s a four-seater, not a five-seater, but, unlike a Vauxhall Adam, it will actually seat four 5’ 9” people comfortably and carry their luggage for a weekend away. We got to drive a TwinAir that was basically ‘Distinctive’ spec, but fitted with more comfortable 195/55 R16s and a very distinctive dashboard hue of red fading into grey. That sharply divided opinion. Some hated it. Some loved it. I sided with the lovers. It has a lot of character. 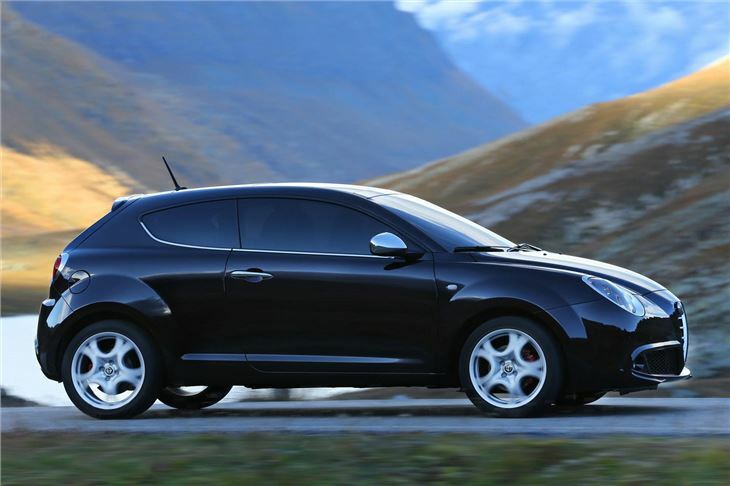 John Slavin tested the 85PS MiTo TwinAir before, but an extra 20PS puts icing on the cake. 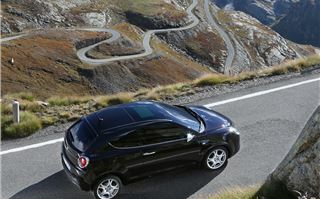 If there are any bends on the road (and one of the roads we drove was all-bends) you need ‘Dynamic’ mode in the DNA. That sharpens up throttle response and adds enough weight to the steering to feel as if it has genuinely weighted up from the cornering forces. 105PS at 5,500rpm, 145Nm torque at 2,000rpm and a light flywheel means you run out of revs very rapidly. But get used to it and keep it on the boil and it’s a lot of fun, even on damp, greasy roads. It doesn’t feel anything like the FIAT Punto that ‘leveraging synergies’ (chassis sharing) is what originally lay beneath. Switching the DNA to ‘Natural’ lost throttle response and steering ‘feel’ and, unlike the 170PS MiTo Cloverleaf I drove in Scotland 3 years ago, ‘All Weather’ mode turned it into a slug. Back in ‘Dynamic’ on the 195/55 R16 tyres it was fine. 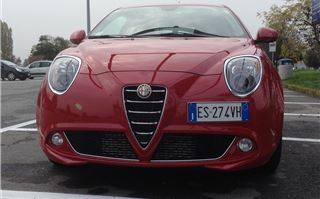 On the Autostrada, 3,000rpm corresponded to about 70mph on the speedo and it was happiest at about 3,200rpm. Cruising at 3,500rpm (the Autostrada limit), some tiring harmonics seemed to set in and fuel economy plummeted from about 42mpg to about 37mpg. It also felt better on the dried out Autostrada in ‘Dynamic’ mode of the DNA, the added stiffness through the steering helping to keep the car straight. In ‘Natural’, steering response felt a little delayed and in ‘All Weather’ passing trucks could become mildly adventurous. Whether that would be different in heavy rain I can’t tell you. I hope so. 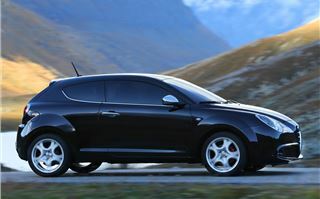 At £15,550 for the Distinctive, and at £16,300 for the Sportiva, the MiTo TwinAir is starting to sniff at Fiesta ST pricing. 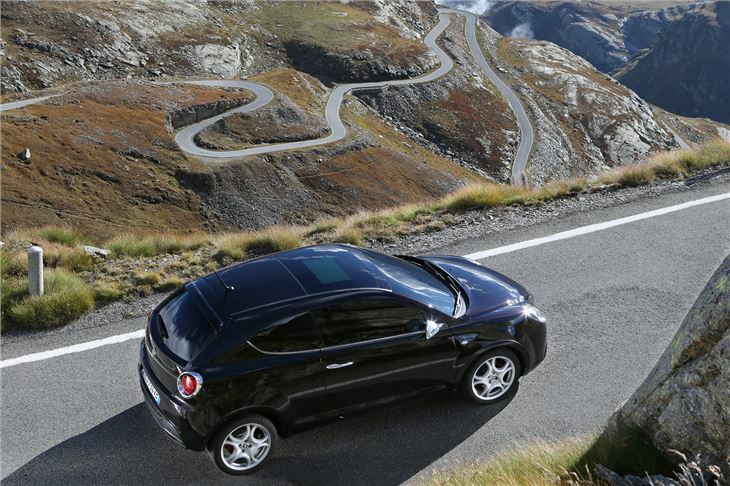 (The MiTo 1.4 MultiAirs are firmly in that price bracket.) 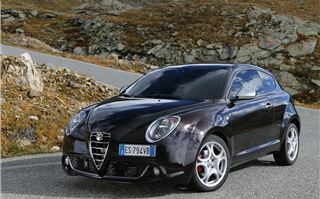 And there’s no way the MiTo is any match for the Fiesta ST. But a company can’t write off the full purchase price of a Fiesta ST against a single year’s tax, and it can write off a MiTo TwinAir, with big tax benefits for the company driver too. And that actually puts it on my list as a car to consider.